Arizona’s most comprehensive and up-to-date calendar of STEM events. 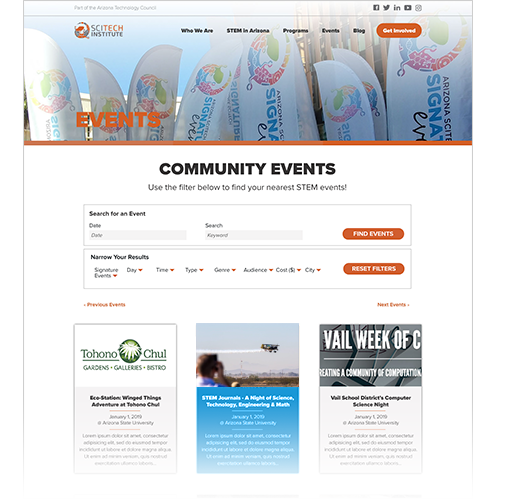 The SciTech Institute’s Community Events Calendar is the #1 resource to learn about and register for STEM events taking place throughout the state of Arizona. With new events added almost daily - both by our trained staff and by you, our community liaisons, the Community Events Calendar is the most up-to-date and comprehensive list of Arizona’s STEM activities available anywhere on the web. View or bookmark the calendar today to find STEM events in your city or region. Use it’s simple, interactive filtering tools to find the perfect fit based on age group, topic, audience, location, and much more. And most importantly - don’t forget to check back often!